Hamish Fulton first came to prominence in the late 1960s as one of a number of artists – including Richard Long and Gilbert & George – who were exploring new forms of sculpture and landscape art. A central characteristic of their practice was a direct physical engagement with landscape. Fulton’s time as a student at St Martin’s College of Art and his journeys in South Dakota and Montana in 1969, encouraged him to think that art could be ‘how you view life’, and not tied necessarily to the production of objects. 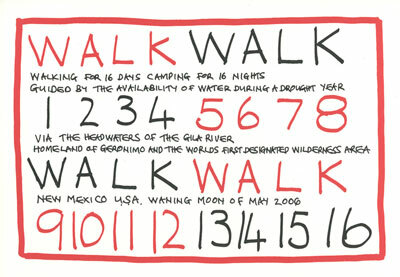 He began to make short walks, and then to make photographic works about the experience of walking. Previous postWeee, weeee, weeee Next postTLW is "SOLD OUT"